There are quite a few baby trends picking up steam for 2014. We did some research and came up with a few things that are very hot in the world of babies this year. What’s in a name … Baby name trends continue to evolve. This year, more and more girls will have traditional boy names as middle names. Don’t be surprised to see combinations like Gracie James and Lucy Charles, either as a form of creative expression or to honor a family name. The overwhelming popularity of Pope Francis has also translated into a baby name trend. Frances, Frank, Francine, and Francesca are all making appearances in hospital maternity wards this year. Grow with me nursery … 2014 is seeing changes in nursery décor as well. Cutesy nurseries filled with trucks, trains, and tiaras are a thing of the past. 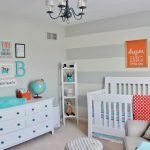 With a shift toward modern, nurseries are now as stylish as the rest of the home. Parents are steering toward sophisticated rooms a baby can enjoy well into his school years. When it come to color, navy and gray are the new neutrals, regardless of gender. Both colors instantly give the room an air of sophistication, and the accent colors can add touches of girly and whimsical or masculine and bold. And all that stuff … Once you have the baby with the awesome name in his very chic nursery, you start to amass the accessories. 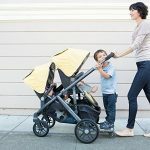 As every parent will tell you, babies need a lot of “stuff.” There’s the stroller, the car seat, the swing and a plethora of toys. Fortunately, today’s baby gear is more stylish than ever, and toys are taking on a nostalgic, back-to-basics trend. Parents and grandparents alike fondly remember these and will excitedly participate in playing with the little ones. The Fisher Price Chatter Telephone, for example, was first introduced in 1962. 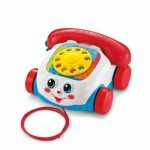 More than 50 years later, this rotary dial telephone is still making little ones smile, even if the concept of a rotary phone is as foreign to them as potty training. 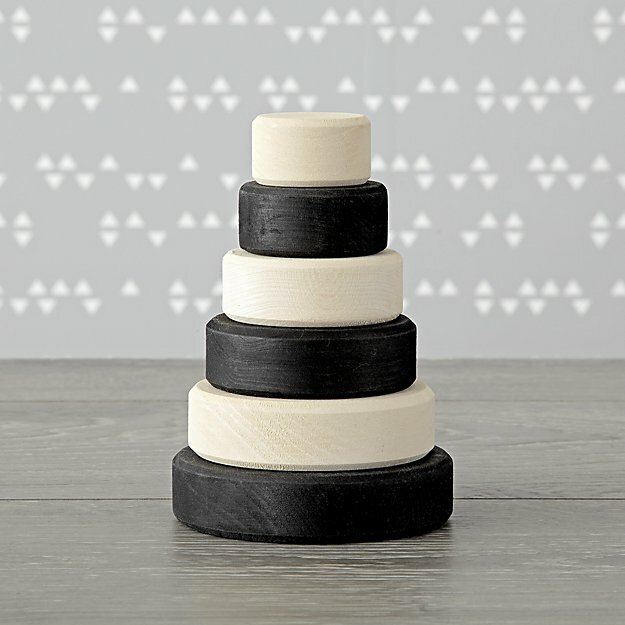 Stacking toys like the Wooden Stacking Ring from Crate&kids have also been around for decades, and for good reason. 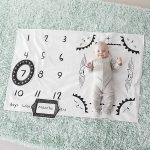 They are among the most popular baby and toddler activity products, allowing little ones to learn their colors as they develop hand-eye coordination. So there you have it … three emerging trends in the world of baby. If you’re having a baby this year, we hope we you enjoy these toy and design options for little Ava Alexander. AskCheryl: How Late Can I Send a Baby Gift?